In the bustle of our day to day lives, with grandkids being shuttled from sports to school to activities, grandparents may feel they are sometimes left on the sidelines. But, the truth is that grandparents are vitally important in the lives of their grandkids… they may just forget to show just how much sometimes. 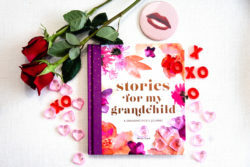 As part of my book, The Grandest Love: Inspiring the Grandparent-Grandchild Connection, I collected 30 letters from grandchildren of all ages and backgrounds, asking them to share what they had learned from a grandparent. I was fortunate to include my own grandchildren in the process. Here’s a letter from my granddaughter Kathryn (always Katie to me), now 28. I enjoyed playing catch, and as I grew older, I played softball, soccer, and basketball. Through the years my grandpa would continue telling me to keep my eye on the ball. No matter what sport it is you have to be determined and stay focused. Well, I soon learned that keeping your eye on the ball did not only have to be about a tennis or soccer ball, but was a way of thinking about life and keeping focused on anything you wanted. If you want something enough, you need to work hard and keep track of the objective, no matter what it is. I know that what I’ve learned from my grandparents will help me through the rest of my life. I’ve come to believe that grandparents are truly teachers to their grandchildren. It is not only the parents’ responsibility because of the luck of knowing the loving, amazing grandparents I have been blessed with. Overall, I could not be more grateful to have a family that is open to feelings and communicates well with each other. I also feel fortunate to have grown up in a well-rounded environment that has always involved “playing” together on vacations and participating in outdoor activities, as well as observing religious holidays and serious family discussions… all built upon the foundations created by my grandparents. As great as all the memories are, when asked to put in writing what I have learned from my grandparents, I wanted to be sure to do it justice by expressing the impact of their unconditional love. This love they have given me and the rest of our family a foundation to live a happy, healthy life… no matter what our road or how curvy it may be, along the way. What I carry with me the most from my grandparents is fairly simple: to be a good person, a good family member, and to play an active role in every community I am a part of. Go ahead, ask your grandchildren to write their letters to you! What Would You Say to Your Grandparents? Jerry Witkovsky is the author of The Grandest Love: Inspiring the Grandparent-Grandchild Connection, a self-help, how-to guide to enable families to connect more deeply across the generations. A long-time social work professional, grandparenting activist, and passionate Grandpa, Witkovsky guides you toward the Grandest Love of all, with fresh approaches to helping grandparents enter their grandchild’s world to leave values, not just valuables and create a living legacy. Learn more at http://www.TheGrandestLove.com.